The Bangor University has responded to changes in the Financial Services sector with its offering of a NEW Post-graduate Certificate in Banking Management and Technology (CERTBMT). The CERTBMT targets persons who may already have a MBA, and would like to improve their skill. 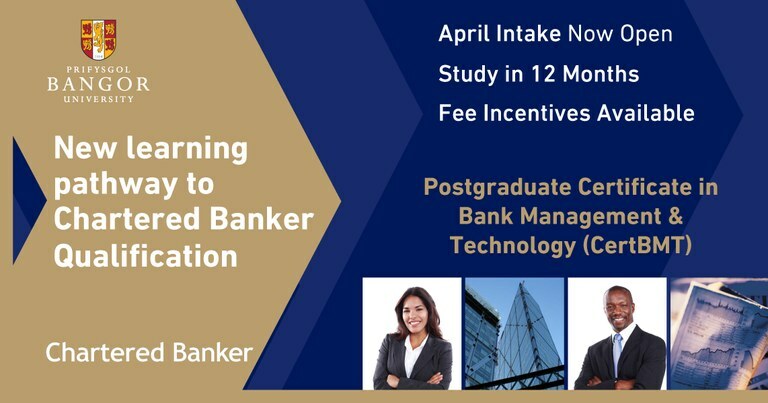 The CERTBMT is globally recognised and provides an accelerated route toward Chartered Banker status as well as the Chartered Banker Masters In Business Administration (CBMBA). Its blended learning and flexible delivery makes it ideal for busy professionals. Registrations for the first ever cohort for the CERTBMT are currently ongoing with an introductory special of 50% discount if the applicant is being sponsored by their employer. With an appreciation for the rapid changes in the sector facilitated by technology, the CERTBMT is designed to arm the next level leaders in the financial services industry.